Sometimes, you've just got to let your feet do the talking! Step into the world of kickboxing, a sport that is both intensely competitive and a great workout. Master front, side, and roundhouse kicks during drills designed to build your core strength, endurance, and form. 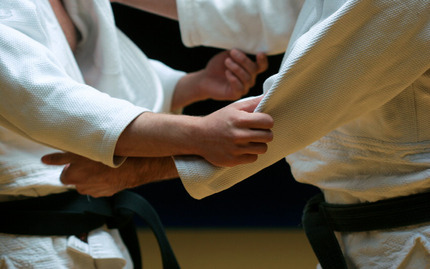 Take it to the mat in sparring competitions that'll will help you develop your awareness and situational fighting. Along the way, you'll be shredding calories and packing on muscle, developing a fighter's body that will turn heads. In addition, you'll develop the sense of empowerment and disciple that comes from physical training, allowing you to overcome problems outside of the dojo with renewed clarity. And when you can't overcome them in the traditional sense, you can always kick them in the face. This is a free trial class for first time attendees only. As a courtesy to fellow participants, please provide at least 24 hour cancellation notice.